Employees at our HANSATON Headquarters in the Hamburg district of Hammerbrook (City South) have jobs and responsibilities as diverse, exciting, and multi-faceted as Hamburg itself, HANSATON’s “home port”. Whether they’re hardware development specialists, precision engineers working in production, or graphic designers for our Marketing department, all of our HANSATON team members share a common goal of helping people around the world discover optimum hearing, and all of them give their best in pursuit of this goal, day after day. At HANSATON, “Made in Germany” is a true promise of quality. Engineers in the Production department can personally assist with the Development department’s innovative new ideas. This continuous exchange of knowledge benefits all of our experts by accelerating processes and fostering cooperation. Short routes to better communication. Would you like to shape your professional future here at HANSATON? Click here to view our job postings. Here’s a little more information about a few of our departments. The HANSATON customer service team is the face of HANSATON, and the familiar, friendly voice on the telephone. Congenial, competent, and committed. They, along with our local area sales managers, are responsible for processing orders smoothly, and advise customers on the HANSATON product portfolio. We offer our HANSATON Partners solid consultation by identifying their individual needs and wishes in order to provide the best possible service. Click here for contact information. Besides handling any number of organizational and coordination tasks, the creative minds in our Marketing department develop new and effective methods for HANSATON and its partners to address customers and retain them long-term. Print or online publications, across the globe or for a single audiology practice— our experienced communications strategists and designers conceive, design, and write copy for everything from target-group-specific mailings, brochures, and ads to shop window concepts, apps, websites, and worldwide advertising campaigns. HANSATON engineers develop hearing systems based on the principle of “optimal hearing, anytime, anywhere”. High-resolution sensors, exceptional signal processing—the team does truly pioneering work with its innovative ideas. Our research and development staff always have one clear objective in mind: to use cutting-edge technology and outstanding design to help people around the world experience optimum hearing. HANSATON hearing systems have already received several awards in recognition of their exceptional innovation, functionality, and design. The HANSATON production facilities bring together people and hearing systems, high technology and craftsmanship with astonishing ease. The majority of our employees are trained precision engineers and electricians. Most of them have been a part of our team for many years, and all of them learned their trades “from the ground up” here at HANSATON—a further guarantee for HANSATON’s renowned quality. ITE production, BTE production, quality assurance, warehousing, packaging, shipping—all on one level. That’s what we call working hand-in-hand effectively. 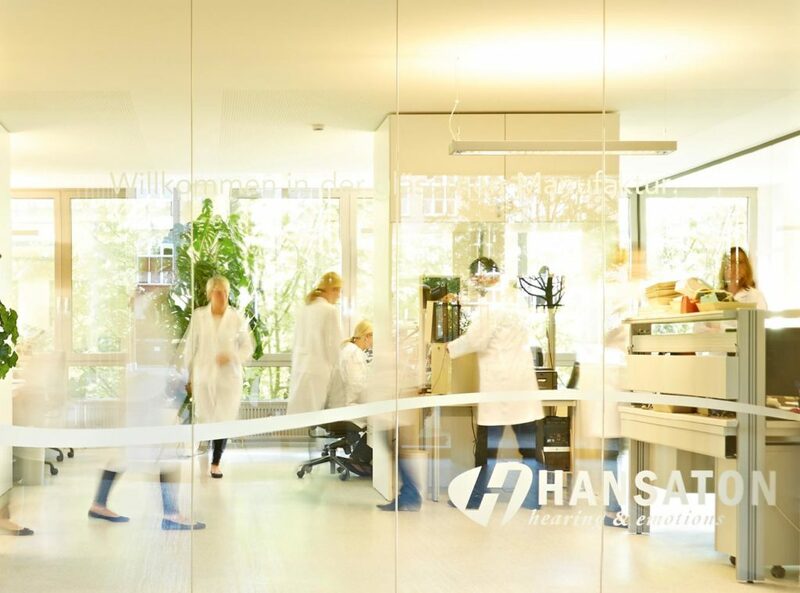 Here at HANSATON, we place a great deal of importance on professional development, which is why an entire floor of our glass-front production facility is devoted to that very purpose: the HANSATON Training Center, looking out upon the beautiful Middle Channel here in the south of Hamburg. Here at the training center, we support and challenge our staff, invite our partners to come to Hamburg and exchange ideas, and offer apprenticeship and master-exam preparation courses for audiologists. HANSATON’s audiologists are happy to answer questions about our product portfolio or software at any time, whether you’re looking for practical basic information or highly specialized expert knowledge. You’re welcome to make an appointment on location or attend one of their special seminars here in Hamburg. Click here for more detailed information on the HANSATON Training Center along with a list of upcoming seminar dates. Demand is high all over the world for top-quality hearing systems created by the experts. Our colleagues in our Exports department are points of contact for HANSATON representatives and distributors in over 70 countries worldwide. Their responsibilities include country-specific administrative work and order processing, international customer service, and other administrative duties. Our Exports department team regularly invites our colleagues from all over the world to Hamburg for workshops and training courses, providing not only expert professional knowledge but also insight into typical North German traditions, such as tasty Franzbrötchen or our hearty greeting of “Moin, moin”.